Toasted Hemp Seeds is a HIT! 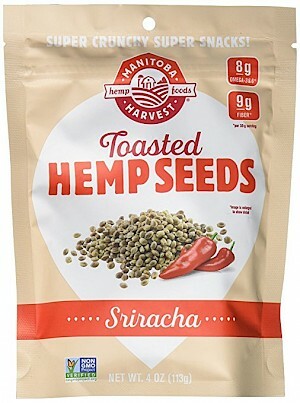 You know I love hemp - and this new flavor is no exception. Yes it's Sriracha that, yes I'm a bit tired of, but this recipe works. Just 3 tablespoons contains 8 grams of omega 3s, Omega 6s and 9 grams of fiber. Eat out of the bag as a snack or sprinkle on a salad. 160 calories, 11 grams of fat, 160 mg of sodium which I'd like lower, 1 gram of sugars and 8 grams of protein. One note for the package designers - you can't read white on beige - please change it - be proud of your ingredients and your story! Imported from Canada.